The Culinary Gadabout: What's in your peanut butter? Do you think one peanut butter is like another? Contains 2 Percent Or Less Of: Fully Hydrogenated Vegetable Oils (Rapeseed And Soybean), Salt, Mono- And Diglycerides, Molasses, Niacinamide, Folic Acid, Pyridoxine Hydrochloride, Magnesium Oxide, Zinc Oxide, Ferric Orthophosphate, and Copper Sulfate. I was horrified. Corn syrup solids? Fully hydrogenated oils? What the hell were Pyridoxine Hydrochloride or Ferric Orthophosphate? And isn't Zinc Oxide that white stuff in high-quality sun block? Curious, I next perused the ingredient labels of all peanut butters on the shelf at my grocery store. Most of them contained icky ingredients that I didn't think should be in peanut butter. Or in me. 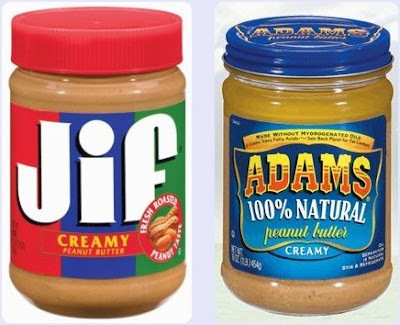 I finally settled on a jar of Adams 100% Natural Peanut Butter, which comes in these varieties: Creamy, Creamy Unsalted, Crunch, and Crunchy Unsalted. Soon after, on a trip to Trader Joe's, I discovered that store's house brand peanut butter. From then on I've stuck to Adams and Trader Joe's peanut butters. The ingredients in both? Peanuts. That's it. And isn't that as it should be?